Muddy winter weather and snowfall? Not to worry! 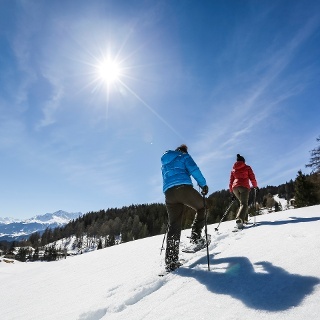 Since you are almost always in the woods on this easy tour over the Brambrüesch plateau, it can also be completed without problems even if the weather is less than perfect. The Brambrüesch, the home mountain of Chur, which extends to 2200 metres altitude with the peak of the historic Dreibündenstein, is located right around the corner from the historic part of town. About a quarter of an hour after you get on the gondola, you will find yourself exactly 1000 metres higher – in the middle of a natural snow paradise. 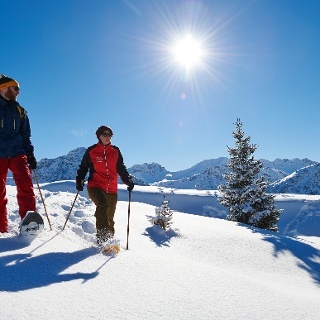 From the starting point at Brambrüesch, this easy circular tour first follows the winter hiking trail to the station of the ski lift. After a short ascent close to the lift, the trail branches to the right into an idyllic forest scenery with snow loaded trees. You are actually not far away from the lift and restaurans at Brambrüesch, but you walk through wonderful stillness until you get to a plain, which is ideal for a break. From the forest glade the trail then descents back to the starting point at the gondola station Brambrüesch. This route is easy to hike and ideal for snowshoe novices. Because the terrain is gentle and practically the entire tour leads through the forest, it is can also be managed easily even with poor visibility or in snowfall. And in the rare case that the weather is in fact too bad: the Brambrüesch has several cozy mountain restaurants to offer where you can warm up again. 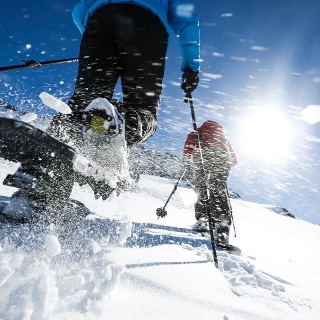 Snow-shoes can be rented at Brambrüesch, at the AIS-Sportschule in the Brambus-Center (opposite of berg.baiz restaurant and t-chair lift-station). Please stay on the recommended route and stick to existing tracks (keep out of wildlife reserves). 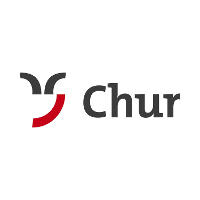 Mit dem Zug bis zum Bahnhof Chur. Von dort fährt der Stadtbus (Linie 1) in 3 Minuten bis zur Talstation der Bergbahnen (Haltestelle Stadthalle/Brambrüeschbahn). Gäste der Chur Bergbahnen parkieren auf dem Stadthallen-Parkplatz bei der Talsation gratis. Hierfür muss die Kontrollschild-Nummer bei der Kassa zwingend angeben werden! The risk potential is a personal assessment by the author. 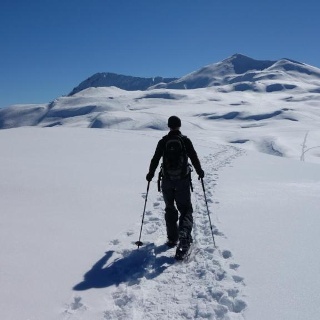 It provides help for the assessment of risks on Snowshoes tours. The scale has 6 scores, whereby "1 = low risks" and "6 = very high risks" means. These criteria refer to hazards in the terrain, which is entered on the tour. 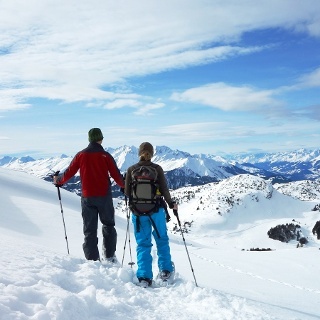 The potential danger on snowshoes tours is always connected with snow conditions and the current avalanche warning level. If the avalanche danger is high, a tour with low risk potential can also be dangerous.